River Sindhu or Indus River is one of longest rivers in the Indian Subcontinent. Sindhu River is having a record of maximum annual flow in India. This river is also a trans-national one. Indus/Sindhu is the longest river flowing through Pakistan. The total length of this river is 3,180 KM. Due to its Trans-national character it is also called as father of rivers. This river is also called as life line of Pakistan. 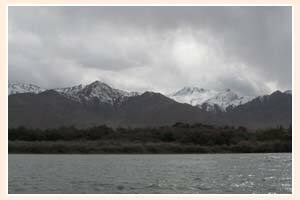 Its origin takes place in the vicinity of Lake Mansarovar. Indus or Sindhu River forms a delta at Sindh province of Pakistan which is called by the name of Sapta Sindhu (Seven Rivers). This delta is a result of collaboration of Sindhu River with the other six rivers naming Beas, Chenab, Jhelum, Satluj, Ravi and Saraswati (Mythical).